The five petaled blooms of Salpiglossis often have dark or contrasting stripes "painted" on each petal, earning it one of its common names of Painted Tongue. 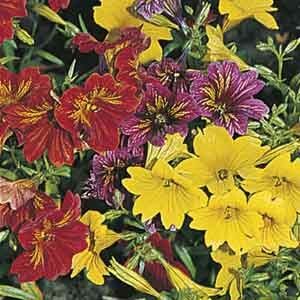 Named varieties offer a choice of beautiful bloom colors and overall plant size. The perfect choice for beds and borders. Perfect for all kinds of containers. Makes a breathtaking potted specimen plant. Wonderful for combination plantings.